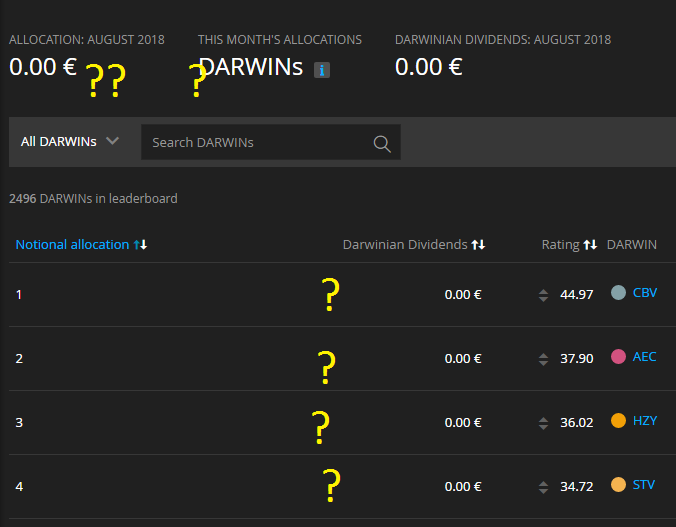 And this month, DarwinIA pays... 7 x 1000 € in Darwinian Dividends!!! Let's start a new competition for April, traders! Darwinian Dividend received. Thank you! You are welcome got my 1.000 as well, now only waiting for performance fees literally pay day for me. A new month! A new competition! April's scoreboard for mid-April is set, but there remains still two weeks (and one day! ) till finish lap! Also this month brings more Darwinian Dividends! @CavaliereVerde would you mind to share some words with us about this second position??? What matters is stacking allocation, the championship matters more than a single race. I am also satisfied for the silent recovery of my LSC . Friday comes and a brief DarwinIA update with it. We see some interesting movements in the Top 10! A surprising appearance of RZX right to the Top!! Spectacular returns from UYZ that lift the DARWIN to the second position. VQB searching the Top 3 in order to achieve 1M€. This is consistency! Come on, traders! Let's keep it running! This end of June is really competitive. Only 2 trading days left. But I‘m really confused about that trading activity calculation. This month CBY generated much more trades compared to the last 2 months and nearly as much as 3 months ago. Because your VaR is reducing from 3 months, from 26 to 15. BTW now it is stable and activity is almost optimal: 94/97 today. Guys, do you have a rough rule of thumb for how many months it takes to get 50 D score, if you are more longer term trader but always in market. not scalper like a large amount of Darwinex traders are. To be competitive for darwinia you need one year of trackrecord. To have a DScore of 50 you need ~7 months if you make at least 20 different trades per month. Thank you for the info. I'l have to find some way of transferring tradestation data then. This July is very difficult for the darwins community. 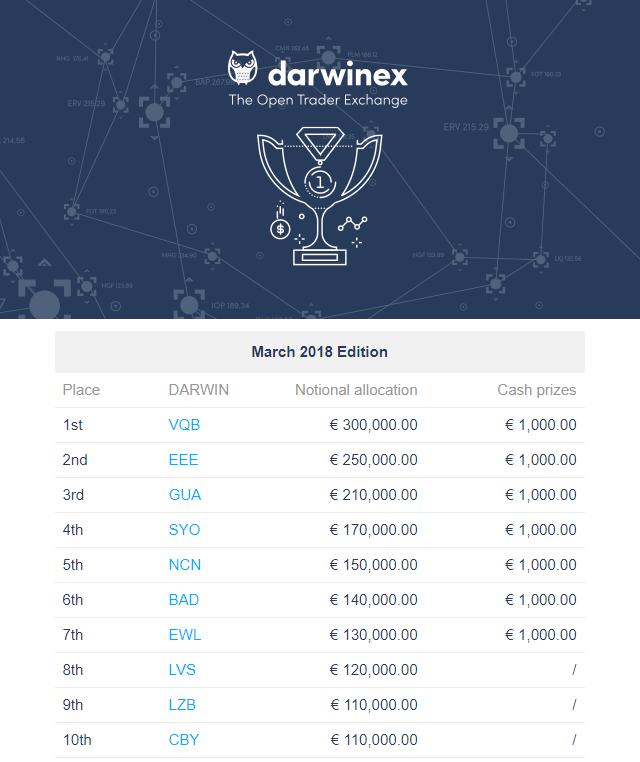 When the market is easy the contest is difficult because you have to beat other darwins. When the market is difficult the contest is difficult because you have to beat the market. It is the "quote of the day"
I know that the scoreboard is unrealiable at the beginning of the month but we are already on day 6 and with a good amount of working days. Is everything allright, are you revising the allocation amounts? It seems that the bug has been solved.